April 14, 2008 — This morning, Truman and I participated in a “Story Tails” reading program at a local elementary school. 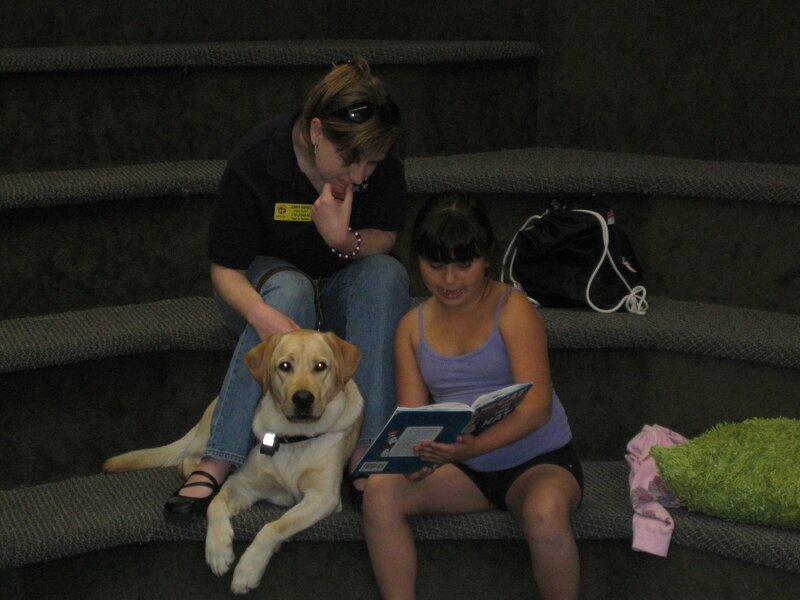 The program is designed to encourage children who have trouble reading to practice their skills by spending ten minutes reading a story to a service dog, after which they are rewarded by getting to pet the dog and ask questions about his or her special job. Truman and I were joined that day by Gina and Halle, a couple of lovely black Labs who, upon career-changing from GDA, decided to become therapy dogs (hence their special bandannas in the photo below). 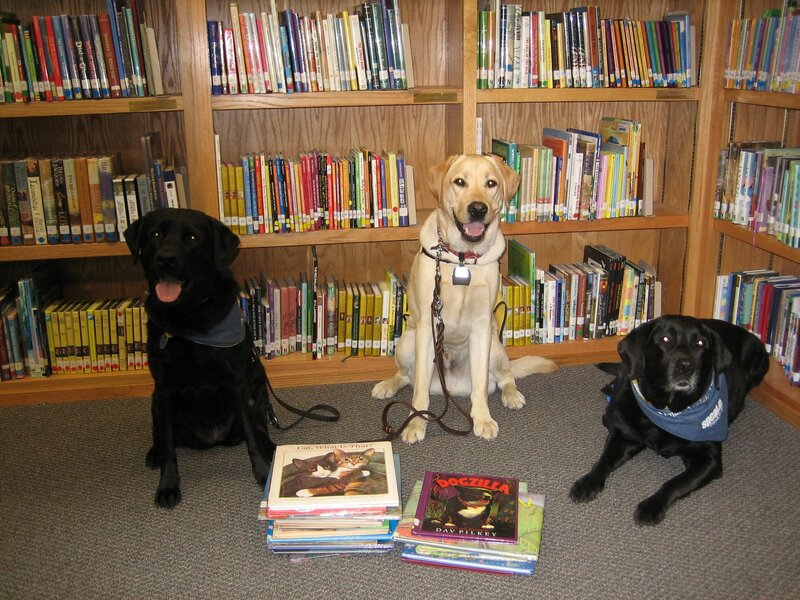 Being the youngest and least experienced, Truman was the most excited dog in the school library that day. The minute he laid eyes on Gina and Halle, any semblance of calm he had walked in with went bye-bye. The librarian who hosted us matched each child with the appropriate dog…one little boy in particular stole my heart. He seemed a bit fidgety at first, and unsure of what he was supposed to be doing, but he settled in after a few minutes and did a pretty good job with his book. The librarian asked me how it went, and told me that she’d matched us because this particular little boy “has a bit of trouble sitting still,” and she thought he and Truman might be able to relate to each other. Sheesh — is it that obvious? Anyway, it was good practice for everyone, and the kids seemed to love reading to the dogs and showing them the pictures on each page. Let it not be said that Truman doesn’t give to his community! What a great thing for you and Truman to do!! And since I missed the other posts, sounds like a great trip!